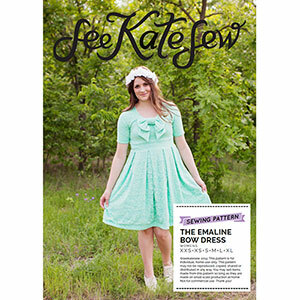 The EMALINE dress is a knit dress with a pleated skirt and banded sleeves. 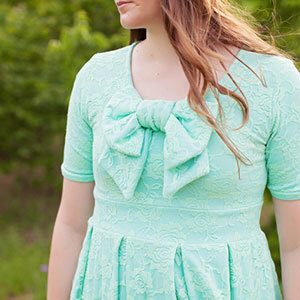 This easy dress is quick to sew and so cute! The band hits at the natural waist for a flattering fit. The big bow can be made in knit or woven fabrics for more versatility. This pattern is excellent for beginners. Make it in a top version, too! Suggested fabrics are mid weight knits with at least 30% stretch such as cotton jersey, cotton lycra, french terry or ponte de roma. Any knit or woven for the bow.